The Business Finance Suite is the most comprehensive system in the world for securing money for business owners. Through the Finance Suite you can get money for your company and then build a business credit score and profile for your business so you can secure even more money without a personal credit check or personal guarantee, and your clients can do the same. The Finance Suite business credit building program offers a simple, step-by-step walkthrough to help get you money for your business quickly, and then begin the business credit building process. 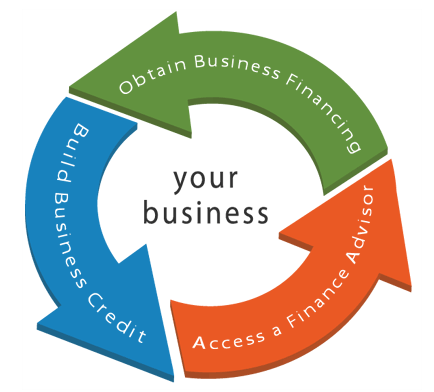 Each of our business credit and financing steps provides its own unique benefits to you and your business. With us you and your clients can build a credit profile and score for your business that is completely separate from your personal credit file. You can build your profile with no personal credit check, and many creditors will approve you with no personal guarantee from you mean you are not at risk. Enter your details below for a no-obligation consultation with one of our business experts. Ask Us About Our $50,000 Business Credit Approval Guarantee! Once you and your clients finish your business credit building in step 5 you are exposed to more funding programs in step 6. Many of these funding programs will allow you to qualify using your newly established business credit profile and score, so you and your clients can get approved with no personal guarantee. Step 6 is the reward you've worked for. You and your clients can now finally separate your business and personal liability and secure money without being personally liable for your business debts. Now you have one of the strongest assets your business can possess, a powerful business credit profile. This means into the future you and your clients will have a much easier time obtaining credit and funding in your business name. You will even start receiving multiple offers from retailers, and Visa, MasterCard, and American Express, for business credit cards in your business name. Now both you and your clients can sit back and enjoy running a business with massive amounts of credit and capital backing you, making it even easier to build the business of your dreams. One of the extremely unique aspects of our finance suite is the cash funding you and your clients have access to, and how fast you receive it. You and your clients will love the idea of building business credit and limiting personal liability. But even more important, you and your clients want cash money for your business and want it quickly. Our Finance Suite is the only system in the world that combines both business credit building and the acquisition of cash funding to insure both you and your clients get more money quickly for your business, even with personal credit challenges. In Step 2 you and your clients will complete their funding application by answering questions relating to your business assets and collateral. Once you've complete this step, your full application is then cross-checked with thousands of lenders’ underwriting guidelines and you're pre-qualified for a massive abundance of funding programs including credit lines and loans. In this step you and your clients have access to thousands of different lenders, hundreds of direct finance sources, and millions-of-dollars in funding for your business. Financing you and your clients can qualify for: merchant advance, purchase order, accounts receivable, equipment, auto vehicle leasing, inventory, unsecured business credit lines, business loans, business credit cards, SBA loans (up to 12 million), and much more. We start by preparing you and your clients for financing by establishing credibility and business planning. Plus many funding programs are based on the business collateral you have, such as credit card sales or consistent revenue. This lending only looks at the strengths of you and your clients' businesses, making it even easier to be approved. The Finance Suite has money available for business owners with challenged personal credit, and even for brand new startup businesses. The Finance Suite offers cash funding as low as $5,000, and as high as $45 million dollars or more. All together the Finance Suite offers more funding sources and products than anywhere else. And both you and your clients have your own certified finance officer to help you navigate your multiple funding options and help you get approved. By offering such a large abundance of financing sources and products we give you and your clients, as business owners, the best chance of being approved and obtaining funding for your business. Once you and your clients have been approved for business funding, we then help you begin the process of building business credit in Step 3. The first step in building business credit is to see what is on your business credit reports now. The Finance Suite makes this very easy, and free to do. You and your clients first will access your Experian Smart Business credit reports. This will tell you if there are any trade lines reporting now on your reports, if you or your clients have an active credit profile open with Experian, how many inquiries you have on your reports, and more. Everything you and your clients need to know from Experian to build business credit is supplied through this Smart Business monitoring, and you and your clients can monitor your credit building in real-time with this feature. Plus the Finance Suite is the only place in the world that Experian actually gives you and your clients this data for free. We even help you and your clients access your business credit reports, navigate them, and teach tips and tactics you can implement to get exceptional profiles and scores. And we assist with activating your business credit profiles. In Step 4 we help you and your clients get approved for new credit in your business name that reports to the appropriate business credit reporting agencies. Much of this credit can be obtained with no personal credit check, and with no personal guarantee required eliminating your personal liability. The first step in building business credit is to get approved with Net 30 vendors who will give you and your clients credit, and who do report to the business credit reporting agencies. Once you're approved and those accounts are used, the accounts are reported and will become your initial trade lines on their business credit report. A tradeline reported to one reporting agency qualifies as a payment experience, and with 5 payment experiences you and your clients can start securing revolving credit cards. You and your clients have over 50 vendors to choose from, the largest selection anywhere. And most of those vendors will approve you for credit even if you or your clients are a brand new startup business. And with the major sources we supply you with, you and your clients can easily find the vendors you want to use to help build your new business credit. Each vendor in the Finance Suite offers extensive details about their company, reporting, and underwriting criteria. Your and your clients can see the bureaus that each vendor reports to, you can learn about the products and services each vendor offers, and you can review the vendor’s actual underwriting guidelines so both you an your clients will know you can be approved before you even apply. You and your clients can even connect with each vendor directly through the Finance Suite in just one-click. And all of your application information auto-populates from the Finance Suite onto your applications for credit, saving you hours of time. So in one-click you and your clients can easily submit your applications to your new business credit vendors. Once your new vendor credit is reported to the business reporting agencies you and your clients are then awarded with an exceptional business credit score. We then help you leverage your newly built business credit profile and score to get approved for even more revolving business credit cards in Step 5. It only takes a few months to build you and your clients initial vendor accounts in step 4 and have them reporting on your business credit report. Once these 5 new accounts are reporting, you can then start securing revolving credit cards in step 5. Much of this credit you and your clients obtain in step 5 is business credit in your business name, so there is no personal credit check required. And much of the credit can be obtained with no personal guarantee from you or your clients eliminating your personal liability. You and your clients will first start with some revolving “starter” accounts including credit cards with retailers such as Staples, Home Depot, Tractor Supply, Shell, Office Depot, and more. As some of these accounts report on your business credit reports, you'll then be able to get approved for even more credit. And you can continue to apply, get approved, and obtain credit in your business name with many well-known retailers, and some they might not have heard of. You and your clients can be approved for credit with Walmart, Costco, Amazon, Dell, Lowes, Sears, BP, Chevron, Sinclair Gas, Speedway, Sam’s Club, Pitney Bowes, Apple, and many more. You can even get approved for multiple credit cards with Visa, MasterCard, Discover, even American Express. As you and your clients build your business credit in step 5 you will see that many creditors will issue you approvals as high as $10,000. And again, these are credit cards in your business name, and many of them require no personal credit check or personal guarantee from you or your clients to be approved. In the Finance Suite each retailer lists the products they sell, who they report to, and also their underwriting requirements so both you and your clients will know you can be approved before you even apply. This is the only system in existence that actually lists the real underwriting guidelines for each account, substantially increasing your chances of being approved.